My dog Valentino had a stress-free vet visit today. 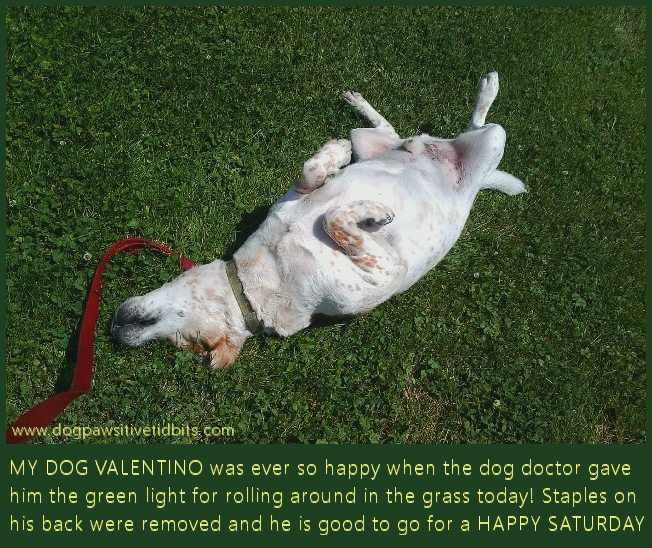 He celebrated his happy Saturday with a vet-approved back-scratchin' roll in the grass! Valentino showed no signs of canine PTSD when the dog doctor removed the staples on his back. He stood for a minute then sat down and still as the vet removed all fourteen staples. I think he handled it much better than I! The doctor checked his gums and found only one suture that had not yet dissolved. She assured me the dissolvable stitch would disappear in its own time. As for Valentino's canine gingival hyperplasia, it would appear as though he is predisposed for the disease. This means we need to keep a watchful eye on his gums for its recurrence. Further, there is not much I can do to stop the idiopathic gingival hyperplasia from returning. I will begin more care in brushing my dog's teeth and gums and schedule veterinary dental cleanings as needed. 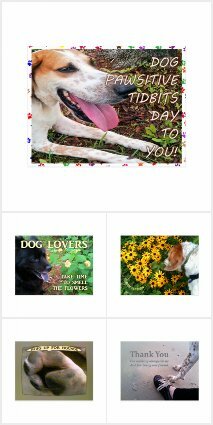 However, the vet said while this will not prevent the recurrence of excess gingival tissue growth it may delay it as well as the surgery to remove it. For now, I watch the hair re-growth over the scar on my dog Valentino's back. And Me and V fully intend to enjoy each blessed day of the rest of our journey together.